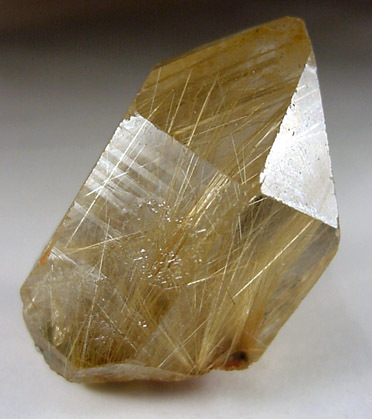 Single crystal of transparent quartz with many inclusions of golden rutile crystals running throughout. Shows minor edge frittering (alluvial?). Natural crystals like this one, with unpolished faces, are hard to find. Overall size of mineral specimen: 32x17x17 mm. Size of individual crystals: 32 mm.